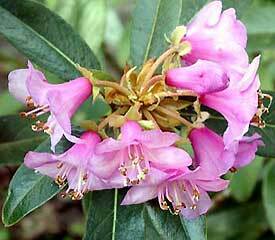 Flower/Truss Description: Campanulate to tubular-campanulate, purple to reddish-rose, pale pink, rarely white. Inflorescence 3-9 flowered. Foliage Description: Leaves narrowly oblanceolate to narrowly elliptic, 1½" to 5" long.